I have today and tomorrow off, which is realllly great because I have to get the rest of the house together! My dad and stepmom are coming over on Sunday for dinner, and I want everything to look nice for when they're here. The only problem is that we don't have a kitchen table yet, so if it's nice we can eat outside on the patio set, but if it's not... we'll be on the floor I guess! Chris and I went to an antique mall that's maybe ten minutes from our house, but they didn't really have much furniture. After that we went to Goodwill, but we didn't find anything there either! Bummer. We'll figure something out. Here's my two favorite boys lovin' on each other... 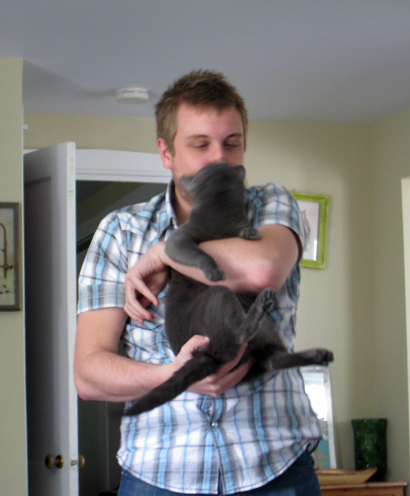 Jeans was in a serious headbutting mood when I took this picture, that's why his head's all blurry. Do any of your cats do this? We call it headbutting, but he really just rubs the top of his head on our faces, and he wants us to kiss his lil head! 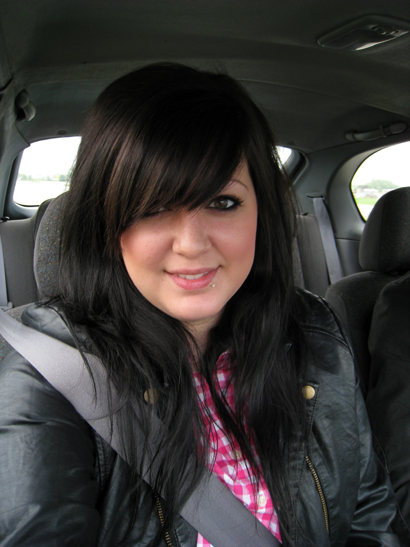 Here's me on the way to the antique mall in Chris's new (to him) car! So exciting! We had gone to Walgreen's two nights ago and on the way back we saw this car in a driveway barely two blocks from our place. Chris called the guy that night, drove it around, and bought it! It's adorable, it totally suits him. Hope you are well! And ps: a big thank you for the questions I'm getting on formspring! I really appreciate you asking me stuff, and not posting weird or mean things, lol! what kind of car did he buy?! It's a 2000 Hyundai Accent!! ahh, your hair is soooo beautiful!